Cystoscopy and Ureteroscopy India offers information on Cystoscopy and Ureteroscopy in India, Cystoscopy and Ureteroscopy cost India, Cystoscopy and Ureteroscopy hospital in India, Delhi, Mumbai, Chennai, Hyderabad & Bangalore, Cystoscopy and Ureteroscopy Surgeon in India. When you have a urinary problem, your doctor may use a cystoscope to see inside your bladder and urethra. 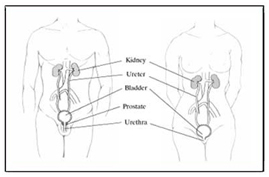 The urethra is the tube that carries urine from the bladder to the outside of the body. The cystoscope has lenses like a telescope or microscope. These lenses let the doctor focus on the inner surfaces of the urinary tract. Some cystoscopes use optical fibers (flexible glass fibers) that carry an image from the tip of the instrument to a viewing piece at the other end. The cystoscope is as thin as a pencil and has a light at the tip. Many cystoscopes have extra tubes to guide other instruments for procedures to treat urinary problems. If you have a stone lodged in your ureter or have an area that needs more study in your ureter, your doctor may recommend a ureteroscopy, usually with general or regional anesthesia. The ureter is the tube that carries urine from the kidney to the bladder. The ureteroscope is a special, very thin instrument used to look directly at and visualize the inside of the ureter. Some ureteroscopes are flexible like a small, very long straw. Others are more rigid and firm. Through the ureteroscope, the doctor can see the stone. The doctor can then move the stone, either by removing it with a small basket at the end of a wire inserted through an extra tube in the ureteroscope or by extending a flexible fiber that carries a laser beam to break the stone into smaller pieces that can then pass out of the body in your urine. How and what the doctor will do is determined by the location, size, and composition of the stone. The doctor may leave a stent, a flexible tube that keeps the ureter open for drainage after the procedure. If you have a stone lodged in your ureter or have an area that needs more study in your ureter, your doctor may recommend a ureteroscopy, usually with general or regional anesthesia. The ureter is the tube that carries urine from the kidney to the bladder. The ureteroscope is a special, very thin instrument used to look directly at and visualize the inside of the ureter. Some ureteroscopes are flexible like a small, very long straw. Others are more rigid and firm. Both types are shown in the diagram at the right. Through the ureteroscope, the doctor can see the stone. 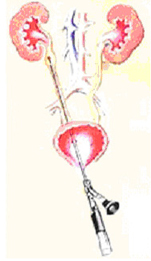 The doctor can then move the stone, either by removing it with a small basket at the end of a wire inserted through an extra tube in the ureteroscope or by extending a flexible fiber that carries a laser beam to break the stone into smaller pieces that can then pass out of the body in your urine. How and what the doctor will do is determined by the location, size, and composition of the stone. The doctor may leave a stent, a flexible tube that keeps the ureter open for drainage after the procedure. If you have a stone lodged higher in your urinary tract, the doctor may extend the cystoscope through the bladder and up into the ureter. The ureter is the tube that carries urine from the kidney to the bladder. When used to view the ureters, the cystoscope is called a ureteroscope. The doctor can then see the stone and remove it with a small basket at the end of a wire inserted through an extra tube in the ureteroscope. The doctor may also use the extra tube in the cystoscope to extend a flexible fiber that carries a laser beam to break the stone into smaller pieces that can then pass out of the body in your urine. Ask your doctor about any special instructions. In most cases, you will be able to eat normally and return to normal activities after the test. Since any medical procedure has a small risk of injury, you will need to sign a consent form before the test. Do not hesitate to ask your doctor about any concerns you might have. You may be asked to give a urine sample before the test to check for infection. Avoid urinating for an hour before this part of the test. You will wear a hospital gown for the examination, and the lower part of your body will be covered with a sterile drape. In most cases, you will lie on your back with your knees raised and apart. A nurse or technician will clean the area around your urethral opening and apply a local anesthetic. If you are going to have a ureteroscopy, you may receive a spinal or general anesthetic. If you know this is the case, you will want to arrange a ride home after the test. The doctor will gently insert the tip of the cystoscope into your urethra and slowly glide it up into the bladder. Relaxing your pelvic muscles will help make this part of the test easier. A sterile liquid (water or saline) will flow through the cystoscope to slowly fill your bladder and stretch it so that the doctor has a better view of the bladder wall. As your bladder reaches capacity, you will feel some discomfort and the urge to urinate. You will be able to empty your bladder as soon as the examination is over. The time from insertion of the cystoscope to removal may be only a few minutes, or it may be longer if the doctor finds a stone and decides to remove it. Taking a biopsy (a small tissue sample for examination under a microscope) will also make the procedure last longer. In most cases, the entire examination, including preparation, will take about 15 to 20 minutes. What should I expect after the test? You may have a mild burning feeling when you urinate, and you may see small amounts of blood in your urine. These problems should not last more than 24 hours. Tell your doctor if bleeding or pain is severe or if problems last more than a couple of days. To relieve discomfort, drink two 8-ounce glasses of water each hour for 2 hours. Ask your doctor if you can take a warm bath to relieve the burning feeling. If not, you may be able to hold a warm, damp washcloth over the urethral opening. Your doctor may give you an antibiotic to take for 1 or 2 days to prevent an infection. If you have signs of infection—including pain, chills, or fever—call your doctor. Possible risks of a cystoscopy include: infection, bleeding, and/or rupture of the bladder wall. 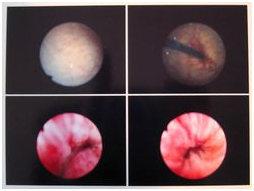 A potential benefit of a cystoscopy is the accurate diagnosis of a variety of conditions affecting the urinary tract. Other benefits of a cystoscopy supplemented by other procedures, such as ureteroscopy, include: biopsy of tissue in the lower urinary tract, removal of stones or polyps, placement of a stent in the ureter to relieve a blockage. In a cystoscopy, or any procedure, you and your doctor must carefully weigh the risks and benefits to determine whether it’s the most appropriate procedure for you.